As you may know, NVIDIA has introduced with the new GeForce GTX 580 a new power draw limitation / protection based on dedicated hardware as well as on graphics drivers. More details are available here: GeForce GTX 580 Power Monitoring Details. Now, a new update of GPU-Z makes it possible to disable the speed throttling mechanism when an extremely demanding 3D app like FurMark is running. This update of GPU-Z 0.4.8 (we can call it GPU-Z 0.4.8b) comes with a new command line parameter: /GTX580OCP that disables the power draw protection until the next reboot. Burned! literally burned! 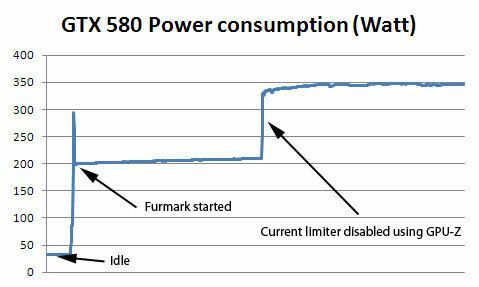 I’ve had complete PC’s using less power than that in full load. And what about the temps? Tripple digits? Cool, what’s the FPS difference? Burned? More like WHO CARES!!! The card uses as little as 10W when idling and my computer uses as little as 80W idle. Its amazing!